As part of the ULP’s activities supporting the expansion of opportunities for higher education in African Least Developed Countries, Professor Jenny Hamilton, Director of the Undergraduate Laws Programmes (ULP), and Simon Askey, Deputy Director of the ULP visited Sierra Leone earlier this month. 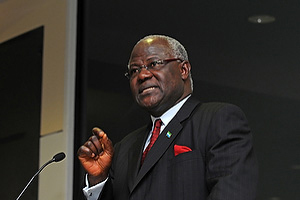 During the four day trip, Jenny and Simon met with His Excellency Dr Ernest Bai Koroma (pictured), President of the Republic of Sierra Leone. Professor Hamilton also participated in a ‘current affairs’ programme on the Sierra Leone Broadcasting Corporation (SLBC) television channel. As part of a successful and very busy programme of visits the Laws team also met with representatives of the British Council, the Guinean High Commissioner, the Guinean Minister for Communication, the Sierra Leone School of Law and also with IMAT, a new institution seeking to become a candidate institution in Freetown, as well as a number of successful graduates of the University of London International Programmes. One (Mr Justice Nicholas Browne-Marke), is a graduate who studied at Holborn College and is now an Appeal Court Judge, whilst the former Chief Justice of Sierra Leone also obtained his LLB, LLM and PhD from the then External Programme. As an LDC, and following a decade of devastating civil war and the displacement of over two million people, the infrastructure in Sierra Leone obviously presents significant challenges. Internet access is limited, roads are basic and power supply fitful. Nevertheless there is clearly an enormous hunger for education, a significant demand for law qualifications, and considerable goodwill towards the study opportunities presented by the University of London International Programmes. We very much hope that this fruitful visit has established foundations for what will be a successful future for the programme in Sierra Leone. Earlier in the month Jenny also travelled to Canada where she participated in a marketing event in Toronto but also visited the National Committee on Accreditation of the Federation of Law Societies of Canada. There she met with the Managing Director to discuss the potential impact of the introduction of the uniform national requirements for all graduates seeking admission to a Canadian common law bar course and the associated policies relating the assessment of foreign degrees for this purpose. There was a helpful exchange of views and information and this visit will be followed up by a formal letter to the FLSC setting out particular areas of concern. Inspiring read. Makes me what to get my degree even more now because I dont have all of this challenges as he did in Sierre Leone. I’m so excited that a team from the University of London visited my country,Sierra Leone.May your good will towards Legal education in that part of the globe be fruitful. Its a wonderful news for those of us who are currently on the program and residing in sierra Leone. The visit to the Law school we definitely be an advantage for us . The ULP should also consider establishing an MoU with the Zambia Institute of Advanced Legal Education so that standard LLB graduates under the International Programme intending to practice in Zambia as advocates are not subjected to repeat some courses at the Unversity of Zambia before they enrol for the bar course at ZIALE. Good to know that even a former chief justice has been a graduate, this will most certainly serve to increase the confidence Sierra Leoneans have in the international programmes! Has IMAT got the approval to serve as the candidate institution for the laws program in Sierra Leone? Our policy is that any of our students have the right to seek external support for their studies as long as the support provider does not violate our trade marks or intellectual property rights. The provider must also not misrepresent the nature of the relationship, or absence of a relationship, with us. In the case of IMAT we have had long discussions and are now considering their application for candidacy. If candidacy is granted we will be able to sign an agreement with them and give them full support to help them develop into a fully recognised teaching centre for the University of London Undergraduate Laws Programme. I will be happy to know when IMAT gets the approval to become a candidate institution for UOL. I will like to take some classes with them. Hope I will be informed.